At the ceremony David Hobbs, senior vice president of operations, United Rentals, presented a $100,000 donation from the company to The National September 11 Memorial & Museum. The donation will help fund the Memorial Glade, a dedicated space integrated into the Memorial Plaza that honors ground zero rescue and recovery workers as well as those who became sick or died from exposure to toxins from the World Trade Center. More than 200 people attended the event, which included a flag ceremony in the front of the building, followed by a building dedication with a ribbon cutting and revealing of a plaque in honor of First Responders. The ceremony included government officials from Ridgefield Park, law enforcement and fire department representatives from New Jersey and New York City, and United Rentals employees and executives. The Stephen Siller Tunnel to Towers Foundation was also present. "This dedication honors those who serve the community every day and those who lost their life," said Hobbs. 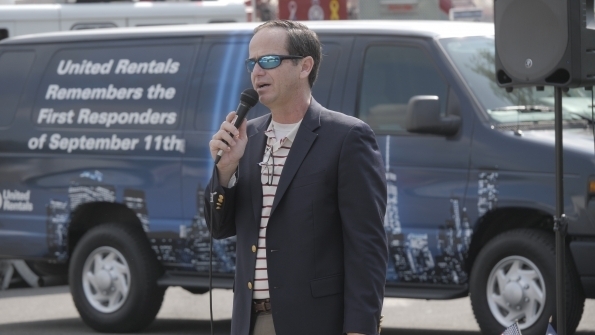 "United Rentals has previously dedicated other Centers of Excellence facilities to the various branches of the military, and we are proud to dedicate our Ridgefield Park building to the First Responders of September 11. The events of 9/11 are an integral part of the history in this region, so we wanted to show our ongoing appreciation and dedication to this community and our country." United Rentals senior vice president of operations presents a $100,000 donation to The National September 11 Memorial & Museum.